Meet and assist at Queen Alia Airport by our representative and transfer to Madaba (the city of Mosaics), Greek Orthodox Church of St. George Madabais a capital city of Madaba Governorate of Jordan, which has a population of about 60.000. Madaba is the fifth most populous town in Jordan. It is best known for its Byzantine and Umayyad mosaics, especially a large Byzantine-era mosaic map of Palestine and the Nile delta. Madaba is located 30 miles south-west of the capital Amman. Proceed to Mount Nebo : The trip south of Amman along the 5,000 years old King’s Highway is one of the most memorable journeys in the Holy Land, passing through a string of ancient sites of Jordan, the memorial of Moses, and the presumed site of the prophet’s death and burial place. From a platform in front of the church one can enjoy a breathtaking view across the Jordan Valley and the Dead Sea. Then drive to your hotel in Amman for dinner and overnight. After breakfast, transfer via the desert high way to Petra. 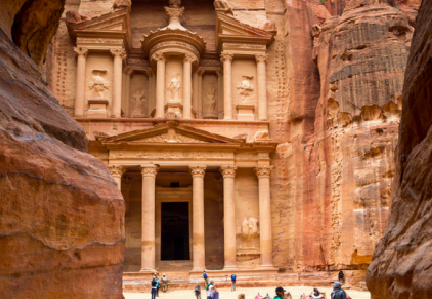 Petra, one of the new seven wonders of the world, and poetically described as “a rose-red city half the age of time”, is an incredible experience for any traveler. Carved into the red rocks of the desert cliffs thousands of years ago by the ancient Nabatean people, Petra was hidden under sand for centuries before recently becoming accessible again. We will tour through the treasury, amphitheater, royal tombs, monastery and much more. After tour ends, transfer back to Amman for dinner and overnight. Breakfast at the hotel and then drive to Sheikh Hussein cross the border. Complete the customs & emigration formalities. Enter into Israel. 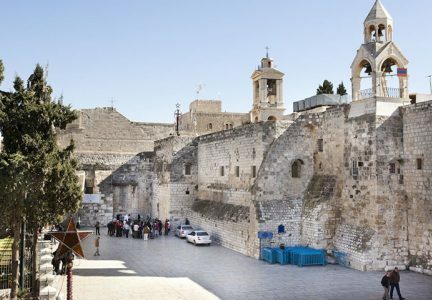 Then Visit Nazareth the boyhood town of Jesus and home of Mary and Joseph and visit the Basilica of the Annunciation built over the grotto where Archangel Gabriel appeared to announce that she would bear a son, Jesus. We also stop by Joseph’s workshop Then Visit Cana where Jesus performed his first Miracle, changing water into wine at the wedding feast. Special weeding Mass in the Cana Church. After Breakfast, visit Mount Tabor. Visit Capernaum – the center of Jesus’ ministry after he left Nazareth we stop at Tabgha – the Church of the Multiplication of the Five Loaves and Two Fishes and the expressive church of the Beatitudes, where Jesus gave the Sermon on the Mount. This morning we drive through the landscapes of Galilee and later for a ride in a replica of a Galilean fishing boat of that time, on the Sea of Galilee and where Jesus calmed the storm and walked on the water. We make a stop at St. Peter’s house, the Church of Primacy of Peter and the place where Jesus bestowed St. Peter with his authority. This is believed to be the place where Jesus dined with his disciples, the flat rock known as Mensa Christy, Chris’s table to commemorate this event. Visit Yardenit on the Jordan River, the traditional Baptismal site. After Breakfast, Check-out Hotel Continue via the city of Caesarea to Haifa, Israel’s largest port city, built on the slopes of Mt. Carmel. Visit the Famous Persian Hanging Gardens for a view of the Bahai Shrine. Then make a brief halt at the “Home of Eujoh”, Lunch at Restaurant. View the beautiful Mediterranean Sea. Visit Ein Karem, located in the hills next to a little spring. This is the city of Judah and Birthplace of John the Baptist, son of Elizabeth & Zechariah and the Church of Visitation Proceed to Bethlehem. Check in hotel. water, rich in minerals. Precede to Bithynia .Visit Bethany the Town of Mary, Martha and Lazarus. Visit Lazarus’s Tomb. Then we go to the Jewish quarter to the Wailing Wall, which is the holiest place for the Jewish religion, back to hotel. After breakfast Proceed to Mount of Olives for a panoramic view of Jerusalem. Visit sanctuaries of Pater Nester Ascension. Walk along the Palm Sunday road down to the chapel of Dorminous Flevit where Jesus wept over eminent destruction of Jerusalem and Garden of Gethsemane. Where Jesus prayed while Judah betrayed him to the Romans. Visit the Basilica of agony and Tomb of St. Mary. We also will visit the Church of St. Peter of Gallicantu, which symbolizes Peter’s Denial of Jesus as he has prophesied at the Last Supper and then visit the traditional house of high priest, Caiaphas, where Jesus was imprisoned. Then proceed to Bethlehem to visit the shepherd’s field, which is located in the Judah province. It was here that the Angel announced the birth of Jesus to the shepherds of Bethlehem during the reign of King Herod. Also, here David tended his flocks until he was anointed King of Israel, lunch. We then visit the Church of Nativity – the birthplace of Jesus and the City of David, Manager Square; Crusaders Cloister Grotto of St. Jerome. Then we visit Milk Grotto. After Breakfast, Check-out hotel. Proceed on a visit to Pyramids, The Great Pyramid of Giza (also called the Pyramid of Khufu and the Pyramid of Cheops) is the oldest and largest of the three pyramids in the Giza Necropolis bordering what is now El Giza, Egypt, and in a historical irony is the oldest of the Seven Wonders of the Ancient World and the only one that survives substantially intact. It is believed the pyramid was built as a tomb for fourth dynasty Egyptian Pharaoh Khufu (Cheops in Greek) and constructed over a 20 year period concluding around 2551 BC. The Great Pyramid was the tallest man-made structure in the world for over 3,800 years Sphinx and the old churches of Cairo. Visit Egyptian Museum. Lunch. Free time and then we proceed for. Cursing on Nile River dinner. After Breakfast, Check-out hotel, then proceed to Cairo International airport for departure. Rate will be advised according to group size and dates. 2 night accommodation includes dinner and breakfast in Amman. 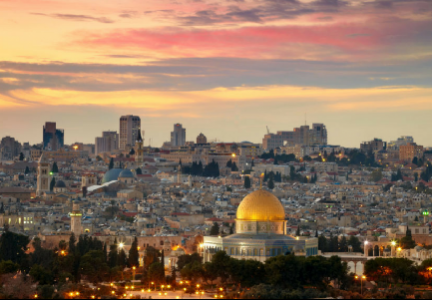 3 night accommodation includes dinner and breakfast in Bethlehem. 1 night accommodation includes dinner and breakfast in St. Catherine. 2 night’s accommodation includes bed and breakfast in Cairo. Transport by experienced English speaking driver in air-conditioned large bus. Government Licensed English languages speaking tour guide. 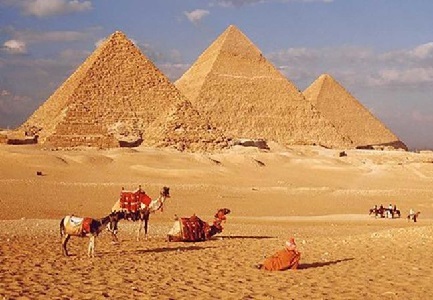 Jordan, Israel and Egypt visa (full passport details must receive prior arrival). small mineral water per person per day.